The cheetah is alone in the genus Acinonyx. A ‘genus’ is a rank in the classification of the species (taxonomy). It is a sort of group of cats with the same fundamental features and in this case it is a group of one, the cheetah because the cats has ‘anatomical peculiarities’. The full scientific name is Acinonyx jubatus. It is not clear how the name was formulated. It was created in 1828. It may be derived from the Greek ‘akaina‘ and ‘onux‘ which means ‘thorn-claw’. This refers to the unsheathed claws of the cheetah. The claws are, in fact, partially sheathed to allow the cat to run fast as they grip the ground. As you know the claws of the domestic cat are sheathed (retracted and hidden) until required. An alternative explanation for the creation of the name is that it is derived from the Greek ‘a‘ and ‘kineo‘, meaning without movement which also refers to the unsheathed claws. As mentioned the claws are not totally unsheathed permanently. They do have some movement and can be retracted. 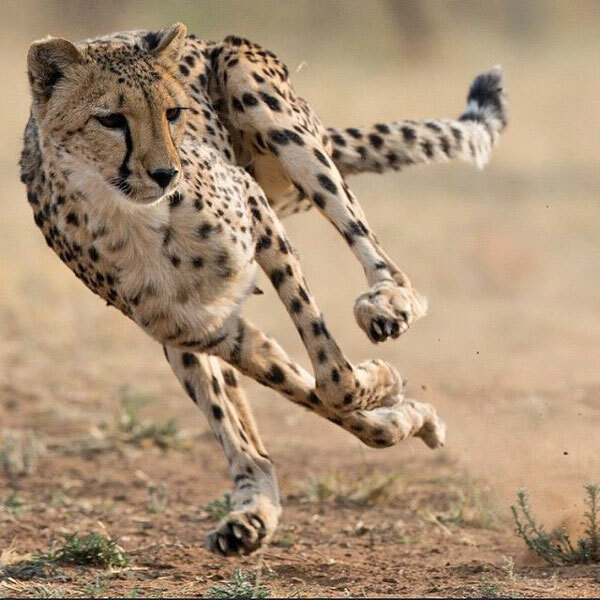 When they are retracted they are still visible because the cheetah ‘uniquely lacks the claw sheaths of the other cats’. Ref: Cat World by Dr Desmond Morris. CLICK FOR A RANGE OF ARTICLES ON THE CHEETAH. This entry was posted in Cheetah and tagged cat claws, cat history, cat taxonomy, cheetah, Cheetah Facts, cheetah history by Michael Broad. Bookmark the permalink. I did not know this. Good to know and thanks!